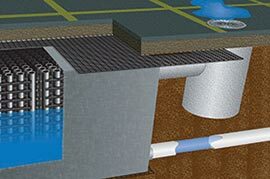 "...saving water need not cost the earth"
Established in 1994, Invisible Structures provides high quality solutions for underground water storage, subsurface drainage, and erosion control. We also provide porous gravel or grass pavers suitable for vehicle parking, walkways and bike tracks as an environmentaly friendly alternative to concrete or bitumen. Our products are all made from 100%, totally inert, post industrial, automobile standard polypropylene. Rainstore3 is an innovative stormwater harvesting and storage systems, offering maximum design flexibility to overcome site challenges - high water tables, rocky sub-bases, difficult shapes and slopes. Modular design enables any dimension for medium and large scale commercial and domestic applications. Rainstore3 won the 2004 SAIV award for constructed WSUD in an established environment and a high commendation in the 2005 Victorian Engineering Excellence awards. Rainstore3 Advantage compliments our range of environment enhancing products, delivering major economy of scale for multi-megalitre installations. Suitable for industrial, commercial and recreational applications. Rainstore3 Advantage is a unique combination of Rainstore modules and internal vertical columns providing a simple construction designed to maximise excavation to storage ratio, maximise storage volume (98% void) and maximise cost effectiveness. Cost effectiveness with its 98% void for Rainstore3 Advantage and 94% for standard Rainstore3, very low excavation to storage volume ratio and very low installation labour costs. Especially cost effective for very large applications. Trafficable by any road legal vehicle, both products have been laboratory and field tested to H-20 and HS- 20 bridge loading and can be installed beneath truck and car parking bays, under slabs, roadways, playing fields or parklands. Draincore2 provides permanent, high volume, lateral, hydraulic flow medium, designed specifically for civil drainage works. Broadly applicable for domestic through to major construction projects and is very effective for draining sporting fields, such as in our Airfield system. Grasspave2 and Gravelpave2 are ideal, invisible reinforced porous paving solutions, both are endorsed for heavy vehicle traffic - fire trucks and maintenance vehicles. 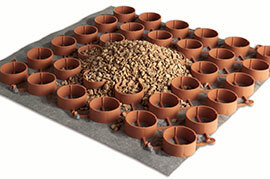 They provide an environmentally friendly alternative to concrete and bitumen paving. Grasspave2 and Gravelpave2 are perfect for use as car parking, access trails, walkways and bike tracks. Slopetame2 is a permanent, reinforced invisible matrix to control erosion on steep vegetated slopes and river banks. 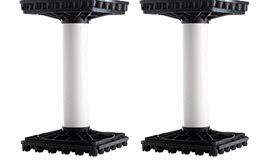 Lightweight and easy to install, three dimensional, interlocking mats of strong, flexible plastic rings keep vegetation in place and allow high permeability for on site water retention. Invisible Structures Pty Ltd offers the option of supply only (for regular clients familiar with our Quality Assurance policies), full turnkey installation (on a prepared base) by one of our experienced teams or we will provide site oversight of installation with labour provided by the client. Take advantage of our considerable practical experience overcoming a wide variety of site specific design issues. Rainstore3 is an advanced modular and stackable structure used to store stormwater underground. 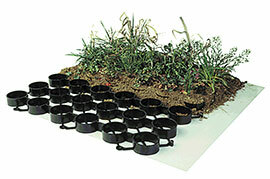 Rainstore3 is a modular and stackable underground water storage system solution. 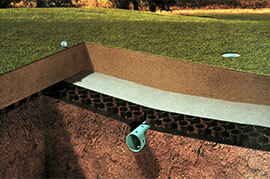 Draincore2 geocomposite drainage & conveyance layer for advanced subsurface & greenroof applications. Gravelpave2 porous pavement allows you to park, drive, walk, or ride on a beautiful decorative gravel surface. 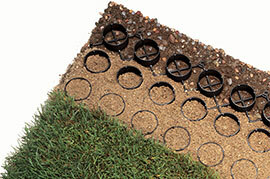 Grasspave2 grass paver allows you to park, drive, walk, ride, or lounge on a beautiful grass surface. Slopetame2 a permanent 3-D reinforcement & stabilization matrix for slopes and channel banks.